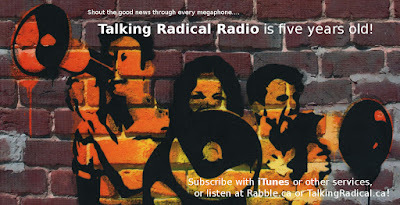 A Canadian Lefty in Occupied Land: It's Talking Radical Radio's Five-Year Anniversary! 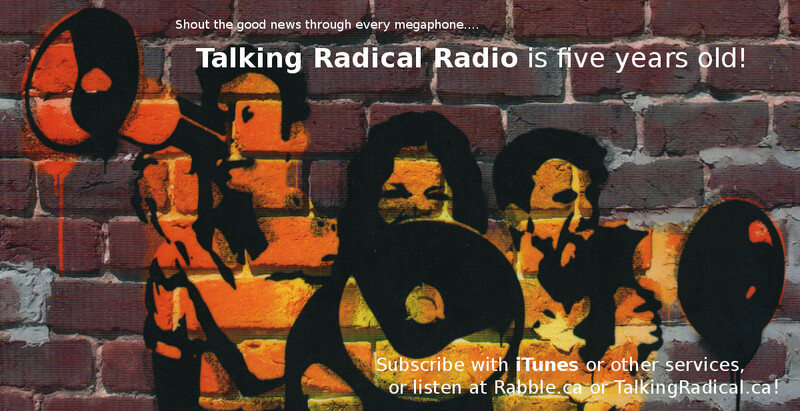 It's Talking Radical Radio's Five-Year Anniversary! Today marks five years since the first episode of Talking Radical Radio appeared. For all of that time, it has been my biggest ongoing project. On a weekly basis, almost every week, the show has brought grassroots voices from across Canada to radio stations and various online venues. It has given people involved in a wide range of social change work a chance to talk in depth about what they're doing, how they're doing it, and why they're doing it. And it has given the rest of us a chance to learn from their experience, insights, and analysis. If you are interested in learning more, you can check out the show's website or follow us on Facebook or Twitter. You can subscribe to the podcast via iTunes, Stitcher, or TuneIn. And you can listen to all of the episodes via SoundCloud and Rabble.ca. A big thank-you to the hundreds of people who have so generously shared their stories with me over the years! And a thank-you as well to the many more who have made suggestions, listened to the show, clicked 'like' or 'share', or otherwise made it possible for this work to continue.